REBOOT is an occasional series of posts on GC:PVD where we identify areas of the city that display poor urbanism and propose ways to improve them. Our interventions may be simple and quite easily realized, or they may at times be grand and possibly take years or decades to complete. Either way, we hope they generate interest and discussion. One of the recommendations of the Metro Transit Study is a series of sub-hubs around the periphery of Downtown. One of those hubs, and the one that will likely see streetcars the soonest, is at the top of the bus tunnel on Thayer Street. One of our readers asks, “how will a sub-hub work at Thayer Street?” And that is indeed a very good question. There is limited space at the top of the tunnel for transit, traffic, pedestrians, and then the amenities one would expect at a transit hub. While I’ve heard no specifics for what a planned sub-hub at Thayer Street would look like (only some murmurs that Brown may have some land to use), I do have whacky schemes in my own head for what a transit hub could look like on College Hill. Here we will look at two of those whacky schemes, one slightly more grandiose than the other. Is this what RIPTA and the city are planning? Probably not. Is this something that could be done given political will, proper funding, and time? Sure, why not? The first option is the Surface Option. It does not require any extreme engineering, but would require some land takings. Basically, the transitway would be extended from the current portal, along Fones Alley to Brook Street. Fones Alley is not wide enough for a proper Transitway so the house at the corner of Fones Alley and Brook Street would need to be taken (preferably moved elsewhere as though it is currently wrapped in vinyl, it is likely a very good house). Also, the strip plaza at the corner of Thayer and Waterman Streets would need to be taken. This I would be quite happy to see go as a strip plaza with surface parking between it and the street is not good urban design for Thayer Street. The building would be torn down and a new building, built to the street, with several floors would replace it. Probably the most controversial takings would be the parking at the back of the buildings lining the south (right in the map above) side of Fones Alley. You can see, there are a lot of cars there, and they need to go somewhere (or maybe all those drivers could take the bus and streetcar). With a wider right of way cleared at Fones Alley there is now room for buses and streetcars to move through and for large platforms for passengers to wait. Benches and roofs for the platforms should also be installed. One of the neighboring buildings (perhaps the new one built were the strip plaza was) can house a RIPTA information center, restrooms, and any office or dispatch space RITPA may need. Until such time as streetcars are extended beyond this area, there will need to be a way for them to turn around. Assuming the streetcars can run backwards (i.e. there is a place for the driver at either end), a third lane for the streetcars to pull into at the end of the Transitway will allow the driver to switch ends of the car, then proceed to the inbound track and pass back through the tunnel without disrupting the buses that will also be serving this Transitway. Even assuming the streetcars will extend to Wayland Square or other points beyond Brook Street in the future. This third lane layover spot for streetcars will probably remain so that some service can terminate at College Hill. This third lane could also run straight through the Tranistway to give a limited number of buses a place to layover while allowing in-service buses and streetcars room to serve the platforms on either side. Allowing buses to layover outside of Kennedy Plaza is one of the reasons for having the sub-hubs afterall. Moving the buses off of Thayer Street gets them out of the heavy pedestrian and traffic movements in the area. Moving the bus platforms off Thayer Street also will allow the sidewalk outside Paragon to be expanded so it is the same ample width as the sidewalks outside the Brown Bookstore. Allowing more room for outdoor dining that won’t impede pedestrian traffic. More grandiose time here. The other option is to re-engineer the portal to the current tunnel, so that it does not come directly to the surface at Thayer Street. Instead, keep the Transitway below grade from the tunnel portal, under Thayer, then ramp it to the surface between Thayer and Brook Streets. This option includes the added expense of re-engineering the tunnel portal and tunneling under Thayer (which would be done via the cut-and-cover method). Having the platforms be below grade also introduces more ADA issues, however a ramp system should be able to be built rather than the expense of elevators. The strip plaza on Thayer Street would still need to be taken, but the house on Brook Street might not need taking, also room may remain available for some of the parking taken in the first option with access via an alleyway to Waterman Street. Even without these takings, this is still certainly a more expensive proposition as it requires a large amount of engineering. The construction phase would be hugely disruptive to the area (though simply laying tracks on the surface will be disruptive too). Having the Transitway run below Thayer Street allows the transit to move smoothly without being impacted by pedestrians and traffic on the surface. The area above the current tunnel portal could also be engineered to support a new building above the Transitway. If the new structure were set back to line up with the curves of the buildings at the entrance to the tunnel, a small plaza could be created out front. Fones Plaza if you will. Currently Thayer is lacking a proper open space area where people can assemble. Think of “The Pit” at the subway entrance in Harvard Square in Cambridge and you get an idea of what a Fones Plaza could be like. Both options move the transition from the tunnel to surface streets from Thayer to Brook Street. The traffic lights at Brook/Angell and Brook/Waterman would need to be coordinated to allow the transit movements out of Fones Alley to be accomplished without traffic backing up on Brook between Angell and Waterman. These same movements are done now at Thayer, though Thayer is one way making for less traffic movements at the tunnel portal. I don’t think these traffic movements are an insurmountable obstacle. Drivers would eventually get used to there being this traffic issue on Brook and move to Hope Street as an alternate route when possible. So there are my proposals for a Transit Hub at Thayer Street. Thoughts? What do you think we’ll actually end up with? Maybe the entire strip mall and parking lot could become the sub-hub, oriented parallel to Thayer St. 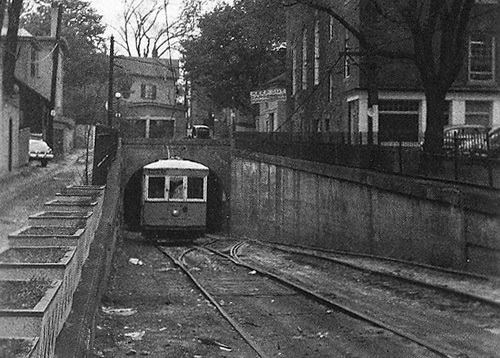 The tunnel could be reserved exclusively for streetcars, which could reverse direction as you describe between the tunnel entrance and Thayer Street. The sub-hub (former strip mall) would be for buses exclusively. Passengers transferring from streetcar to bus (ie express to/from downtown to East Side local) would have to cross Thayer. The direction of traffic on Thayer may need to be reversed to facilitate this scheme (at least between Waterman and Angell). This may be less expensive than the plan you describe and would require less eminent domain takings. However, it doesn’t perhaps look to the future expansion of the system as much as your schemes do. The grandiose scheme may make the most sense as a long term planning strategy, but aside from the cost would likely delay the creation of the College Hill sub-hub for years, well beyond the five-year schedule to re-introduce streetcars currently proposed. 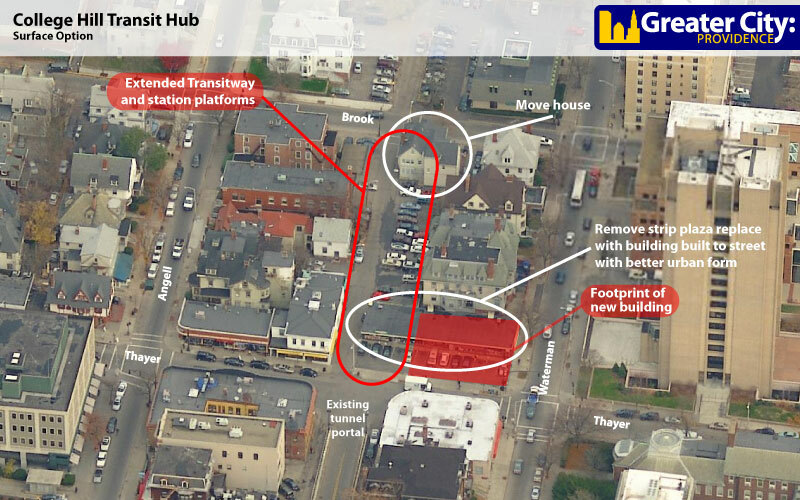 It may be better to use those kinds of resources for developing a “subway station” by reusing the abandoned rail tunnel, which interestingly lies directly below the intersection of Thayer Street and Fones Alley on a diagonal. Reusing the rail tunnel though applicable to the city, has greater potential to benefit the greater inner metro area by connecting the East Bay. Incidentally the red line originally terminated at Harvard Square. When the extension to Porter Square and Alewife were added the disruption to Cambridge was extraordinary bordering on horrible. It took something like three or four years to complete the Harvard Square portion. 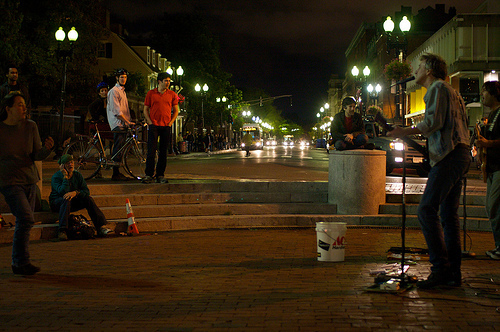 Harvard Square didn’t obtain its public open space until after the subway extension was completed. The creation of the transit hub between Thayer and Brook would be the most practical and would allow for an easy expansion of the streetcar system in the future. Track, catenary and surface platform construction would take a fraction of the time of excavating for an underground station within a dense and active part of the city. Why does it have to take five-years to reintroduce streetcars to the city? If there was more political and public support that schedule could be accelerated by at least a third. There is basically no way to do much in this area without the strip plaza on Thayer going away. I think I favor a hybrid of Peter and Jef’s plans. In terms of lower costs and faster results, I’d use the lot along Fone’s alley and the strip building on Thayer and keep the house at the end. The streetcar portion would be how Jef described, but stop short of the house. The turn-around track at the end could be eliminated since this is currently the end of the propsed line anyway (the driver would simply walk from one end to the other at the Thayer station while at the platform). I would have the two rail lines with a center platform between so it wouldn’t matter what side of the platform the next streetcar arrives at. This would also be less expensive. There would need to be a rail cross-over just about where the strip plaza building is just east of Thayer to allow trains to switch sides and allow better sharing with the buses. This would also create a 4-way intersection that would need a traffic light and pedestrian ctrossings. The bus portion would be where the strip building is now and would parallel Thayer. A second traffic light would allow buses to access the station from the Waterman/Thayer intersection. I don’t understand how you guys would have two-way bus traffic in the area where the plaza is now, with Thayer and Waterman being one-way. I can see buses coming up the tunnel, using the plaza as a bus depot, then continuing down Waterman. But how do buses coming down Angell utilize the plaza as a bus depot, then get in the tunnel? Jef, The busses from Angel could enter Fones Alley from Hope Street, but wouldn’t work for busses coming from the north down Thayer. Why couldn’t the busses follow their current path going in and out of the tunnel along Thayer? Perhaps the bus stops could be shifted to the east side of Thayer, so that pedestrian transfer from bus stops to the new “streetcar station” between Thayer and Brook would be somewhat seamless and separated from cars. If the Fones Alley and Thayer Street intersection is signalized so that streetcars could cross Thayer, busses could also enter and exit the tunnel using the same signal without conflicts with car traffic. Unfortunately, there’s not enough room to situate a platform(s) either in between the tracks or on the two sides of the approach between the tunnel portal and west of Thayer. Your solution for a streetcar station makes the most sense. Besides, no one would miss the strip building’s loss. Admittedly, I’m not terribly familiar with the RIPTA routes with respect to going into the tunnel toward the city. Jef, in your first proposal, do the buses share the station with the street cars? Is Brook Street 2-way? How would inbound buses coming from the North on Thayer access your plan and then get to the tunnel? What about buses coming from Angell (from the east) to the tunnel? Your idea is probably the best. I was hoping to find a way to do it without moving that house since the fewer “issues”, the more likely they go in that direction. Is there a proposed plan from RIPTA/Transit 2020 yet? Right now there are six bus routes that utilize the tunnel. One is the current green line trolley and 3 of the remaining 5 (35,49 and 78) come from Pawtucket and terminate at Kennedy Plaza. The 42 bus from Pawtucket goes on to RI Hospital and the 40 bus is just a loop to Butler hospital at the end of its run. It seems like a streetcar would eliminate the 42 segment to RI Hospital and and it might be possible to reroute the 49 bus to make the Butler run. Are they still eliminating the trolley service? Is the assumption that buses and the streetcar both utilize the tunnel or that the bus routes that now go to Kennedy Plaza would terminate at the new hub? I am not sure how I would feel about taking a bus headed for downtown only to have to transfer to a street car for the last leg. I guess that will come with a more detailed report by RIPTA. I was just thinking of using Fones to Hope as well. There are parking lots facing Fones. I think most of them could be re-oriented to be accessed via Angell and Waterman, but likely the transitway between Brook and Hope would need to allow local access. Not really a huge deal. I do wonder if Fones is still a public right of way through there, or if any part of it has been abandoned and privatized. If it is all public, the easement may be wider than the physical street is now. I do need to take a look at how the buses run and figure if any of them can be removed. Off the top of my head, I’d move the Green Line trolley out. Make it run direct to Wickenden, maybe a Davol/Point Street route. I don’t think the plan is to terminate inbound buses and force people onto streetcars. Inbound buses should still continue to K. Plaza. … not really sure what a street car gains at Thayer … one argument for streetcars is that the investment in infrastructure spurs development … but the tunnel (infrastructure) is already there and the bus and trolley (woefully uncomforable as they are to ride) will always go through here. The report was incredibly vague about the future of the trolleys – which were originally touted as a short fare (not full fare) / short ride option to the regular RIPTA buses. Are they successful in RIPTA’s eyes ? in the City’s eyes ? anyone’s eyes ? They seem to be pretty well used. I just wish they were not faux historic rattle traps but modern comfortable efficient (and narrow body) progressive transportation. Makes more sense to dedicate streetcars to any of the following: Broad Street / Broadway / Elmwood / Atwells / Valley … or somewhere that does not have the investment security of the East Side. As the Brown shuttle, the streetcar from Thayer to Brown BioMed in the Jewelry District (via Kennedy Plaza) and on to Brown’s teachiing hospitals … oh, I get it. The streetcars are for Brown ! … and for tourists who want to take a lap around downtown. Streetcars are great. The proposed routes are not. The Thayer Street (and other sub-hubs) make sense too. Question is what is the size of a sub-hub ? What happens there ? How many buses / trolleys / streetcars / collateral development (retail ?) goes with them ? Is it just a big bus stop ? or is it a development zone ? My bet is that RIPTA sees it as a big bus stop and the City sees it as a development zone. I guess we really need to see a more detailed plan from RIPTA before we can cement some of our ideas for this. I think its safe to say that the easiest, less land acquisition, least expensive option is the place to start.